YOU ARE HERE >> Home > What should I do if I think I am experiencing psychosis? Could the way I’m feeling be due to psychosis? The word "psychosis" is used to describe when someone is having unusual or strange experiences which may be distressing. Someone experiencing psychosis may have difficulty recognizing what is real and what is not real. The experience of psychosis varies greatly from person to person and individuals experiencing psychosis may have very different symptoms. Some people report the experience as being like a ‘dream’ that you find hard to wake up from. What should I do if I think I am experiencing psychosis? If you think you may be experiencing any of the symptoms mentioned on this webpage you should contact your GP as soon as possible. As with any physical or mental illness your GP is usually the first point of contact and will be able to assess your symptoms. Your GP will be able to point you in the right direction based on the information you give him/her so it is important that you tell the GP all of the symptoms you have been experiencing. In addition, you may want to confide in someone close to you that can support you through the process of visiting your GP and accessing services to help you. It is important to point out that using illicit substances can increase the risk of developing symptoms of psychosis and so continuing to use drugs whilst you have psychosis can worsen the symptoms that you are experiencing. 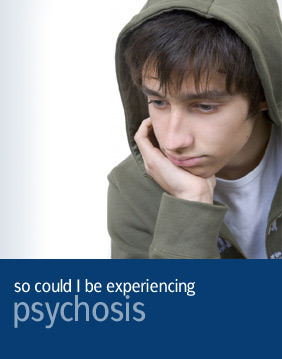 Download the Psychosis factsheet (PDF).